If you ask Noosa regulars or locals for their must do feasts most would mention Sails, located on the eastern side of Noosa main beach. Sails is a beachfront restaurant, with spectacular views, that doesn’t rely on its location to fill tables. Paul Leete, the Head Chef at Sails for over 15 years, has close relations with local growers who, like him, appreciate produce that’s grown with integrity. This means produce that’s organic or not genetically modified and free from pesticides. The menu focuses on fresh, seasonal produce. Because they mix things up with the changing seasons you could visit time and time again without tiring of the menu. The menu is described as modern Australian. But don’t read too much into this. It offers an extensive variety of dishes many of which have global influences. For example the eggplant parmigiana and duck arancini are clearly Italian and the steamed dumplings and king prawn curry would appeal to fans of Asian food. The wine list has been awarded 3 goblets in the Australian Gourmet Traveller Wine List of the Year Awards. Means nothing? Rest assured it’s the highest possible rating. Goblets aside what impresses me about Sails is their passion for the correct storage of wine. Too often I visit a restaurant with a great wine list but then see the wine stored at room temperature in the peak of summer. It’s not ok to serve a bottle of red at 28 degrees. 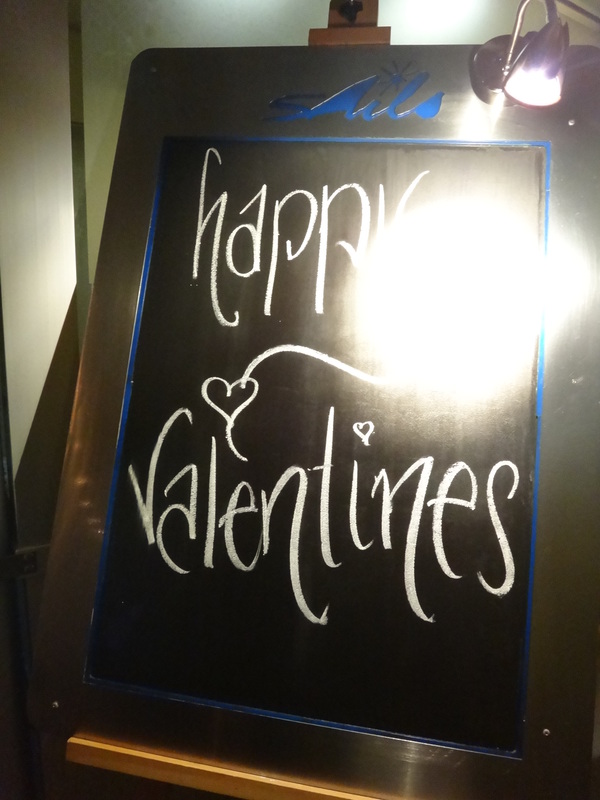 I visited Sails once with colleagues and the other for a Valentines Day dinner. Here’s how my Sails romance unfolded on Valentines Day 2014. The menu was a set one, with a selection of dishes for each course, all of which are available on the full menu. For entree we could choose between five dishes. Three of these showcased local Queensland seafood. Unintentionally we shared the two non seafood dishes – zucchini flowers and free range duck. 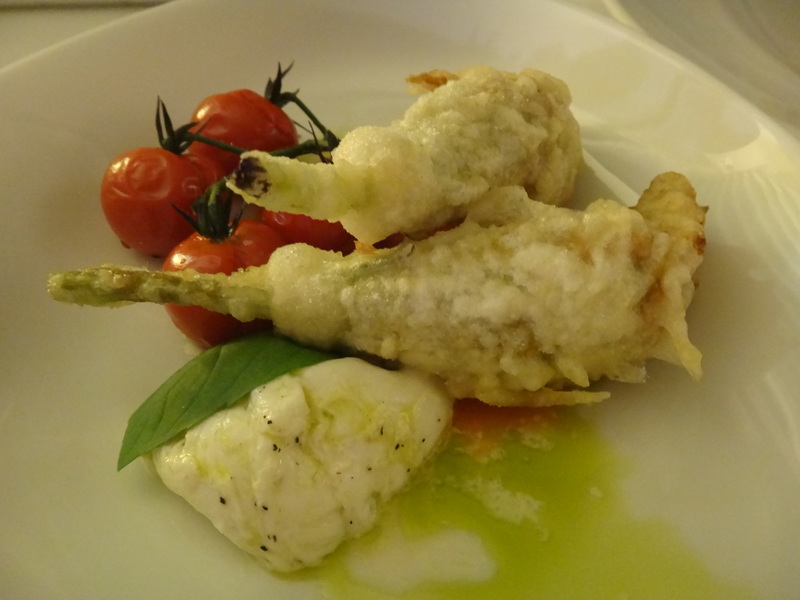 The fried hinterland zucchini flowers, with Cedar Street buffalo mozzarella and served with Noosa reds tomatoes, were a winner. This entree demonstrates how combining simple local ingredients can produce a dish that’s more more-ish that an entree that’s trying to do too much with many ingredients. 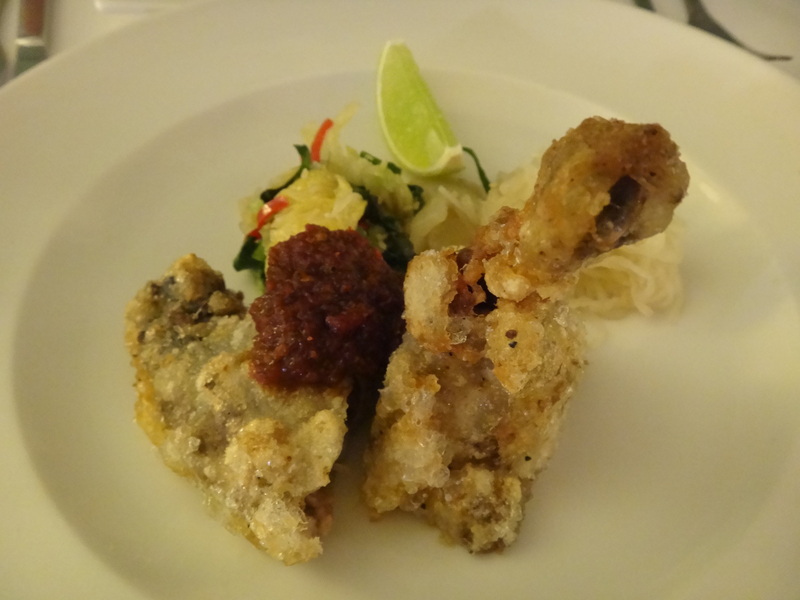 I was pleased to see that the duck was easy to share – two pieces were served with kim chee and chilli jam. The duck meat was juicy and tender. Was it good? Put it this way I had to ask my husband to refrain from using his hands and teeth to bite off every last piece of duck meat! 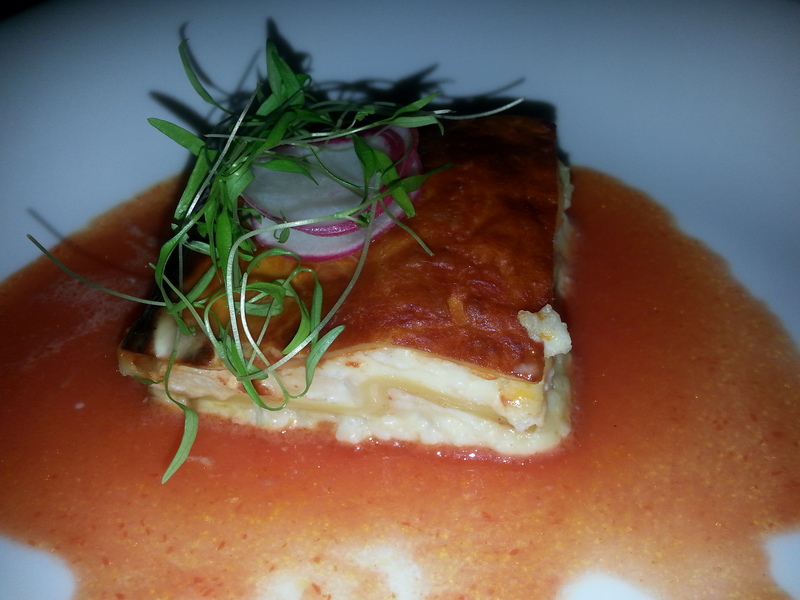 And on my first trip to Sails with work colleagues I had the crab lasagne for entree. The spanner crab, from Fraser Island, was my favourite of the three entrees I tried. Perhaps because it was a clever combination with a generous amount of crab. On to the main course. We both chose the pasta dish for two reasons – firstly to try a never before tasted type of pasta (conchiglioni) and secondly to have a dish that we hoped to be able to replicate at home. Too many restaurants serve ‘meatballs with pasta’ that are average. Typically made with average quality meat and pasta. One exception is Sydney’s famous Cafe Sopra chain (see their amazing meatballs recipe here). Another is Noosa’s Sails. Sails have really gone to town on this meatballs dish – they’ve really put their own stamp on it. 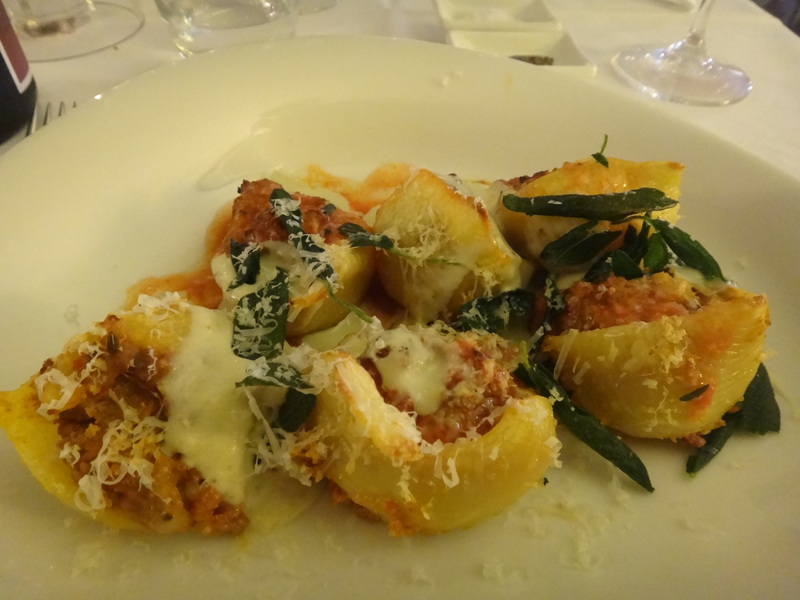 It’s described as ‘baked conchiglioni pasta shells, filled with beef, Italian sausage and ricotta ragout, with gallozola cream‘. What is ‘gallozola’? It’s a blue cheese made in the style of gorgonzola. It’s made by Gallo Dairyland, a family owned business in tropical North Queensland. In nutshell, or should I say ‘in a pastashell’, this was one of the highlights of my Noosa feast. Giant pasta shells, full of an extraordinary filling. Unfortunately side dishes weren’t included on the set menu. But if you make it to Sails don’t overlook the sides. I’d have chosen the ‘cauliflower and Kenilworth vintage cheddar gratin‘. Maybe next time. If you asked me for a recommendation in Noosa I’d say try Sails. It’s only a few footsteps from the sand, and offers food that’s as delightful as the view. Perhaps just consider going for a long lazy lunch instead of dinner. Between 7am and 11am you can grab a coffee from the Sails coffee cart in front of the restaurant. It’s not any old coffee – but rather their own blend of ‘Columbian Black’. Don’t book a table at Sails and assume you’ll have a striking view of the ocean. The restaurant has limited beachfront tables and they’re allocated in order of the date of reservation. For an ocean view book in advance – that means months if you can, not days. Sails does have a two hour time limit on tables booked prior to 7pm – so if you want to really take your time over a long feast then book a late sitting. Keen to give the kids a taste of fine dining? Take them to Sails. The restaurant offers kids meals for $16.50 and all come with ice-cream for dessert. Looking for a beachside wedding venue? Consider Noosa and Sails. Visit sailsnoosa.com.au and you’ll find lots more information under the wedding tab. 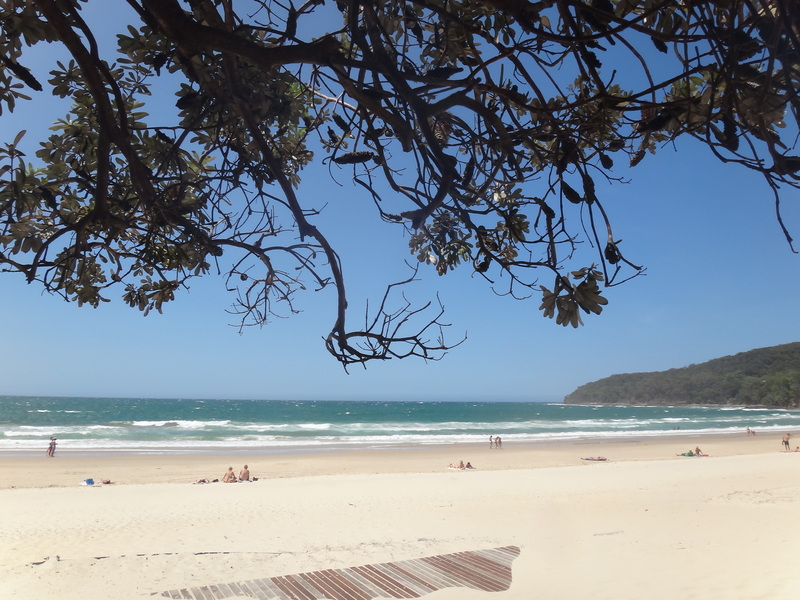 Tags: Noosa Heads, restaurant, review, Sails. Bookmark the permalink.